The Corbitt Preservation Association was formed on November 16, 2003 by individuals who had a vision of history and love for these great vehicles built here in Henderson, NC from 1899 thru 1954. Our first “Corbitt Truck Show and Reunion” was held in 2002. Since then we have had our annual show on the third Saturday of October each year. The last Corbitt was built from spare parts in 1958 and sold to Norris Collins of Franklin Oil Company in Franklinton, NC. There were nine individuals present for the first meeting. They became charter members of the organization. Membership has increased to over 100 members and still growing. Members are from the following states: North Carolina, Virginia, New York, Ohio, Georgia, Missouri, Florida, Pennsylvania and Kentucky. There were four major goals set at this initial meeting. First, and most important, was the preservation of the Corbitt name. Second, was the preservation of Corbitt products, third the preservation of the Corbitt property and fourtly the establishment of a Corbitt Museum. Our goals are being met through projects including the restoration of the 1930’s advertising monument that stood on old US 1 at the Tar River bridge. We moved and restored this monument in 2005 and it now sits at the former factory site on Parham Street in Henderson. A Highway Historical Marker was erected and dedicated in 2006 by the Corbitt Preservation Association with the assistance of the State of North Carolina. This marker sits at the intersection of Dabney Drive and US 158 By-pass. Mr. R.J. Corbitt was inducted into the North Carolina Transportation Hall of Fame in 2007. The Hall of Fame award is on permanent display at the North Carolina Transportation Museum in Spencer, NC. A display of Mr. Corbitt and his accomplishments are also at the museum. A 100th Anniversary event was held in 2010. The two day event culminated with a show of the vehicles on Saturday May 1, 2010. This event was open to the public.And at last in 2015 the establishment of the Corbitt Preservation Association Museum at 180 Court Street in Henderson, NC. The Corbitt Company was located in Henderson in northeastern North Carolina. It was in business there for roughly the first half of the twentieth century.After an apprenticeship in the tobacco business under J.P. Taylor of Henderson, Richard J. Corbitt became a buyer and seller of leaf tobacco, representing Taylor in his birthplace of Enfield, NC and in Henderson, where he settled permanently in 1894. The following year he went into business on his own. Corbitt foresaw the big companies dominating the tobacco industry, so in 1899 he decided to enter the buggy manufacturing business. In 1899, there were four buggy builders in Henderson; eight years later, Corbitt had bought all three of his competitors. In 1905, Corbitt built his first automobile, which he called a “motor buggy”. Automobiles went into full production in 1907. He imported laborers from Detroit so he would have workers knowledgeable about automobiles. But this only added to his costs, and he was losing money on every car he sold. In 1934 Corbitt bought obsolete automobile sheet metal from the Auburn Motors Company and used it for the front ends of its lightest trucks, those in the 11-13,000 pound gross vehicle weight category. Many people considered this a very handsome truck. It was sold for two or three years; only one is known to have survived. From 1939-1945 Corbitt designed and built over 3,200 50SD6 6-ton, 6×6 prime movers for the US Army. These trucks were equipped with either the 779 or the 855 cubic-inch Hercules 6-cylinder gasoline engine. They were used in every theater of operation during World War II. Corbitt lacked production capacity for all the trucks needed, so White, Brockway, Ward LaFrance, and FWD all built the same or very similar trucks. Altogether, over 10,000 of these trucks were built by the five manufacturers. One reason for Corbitt’s success with the military was that the small company was flexible and able to do quick modifications. 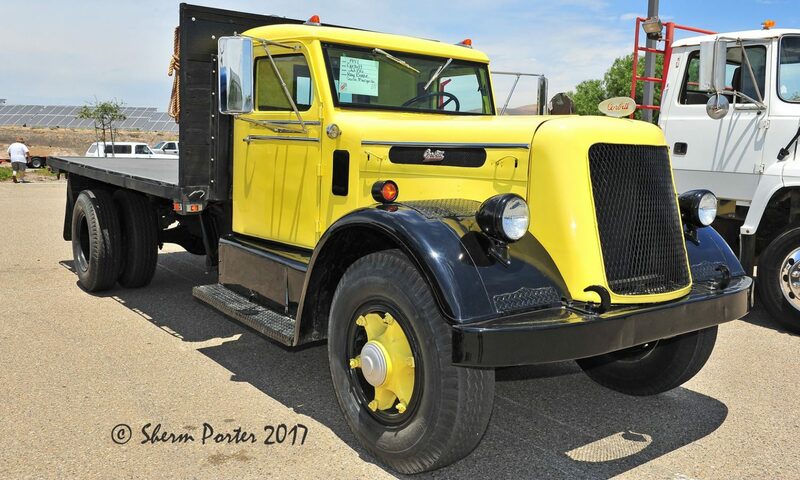 The Army demanded an all-steel cab, so Corbitt discontinued the wooden frame from the 30s and built nothing but all-steel cabs from then on. In 1946 Corbitt built two prototypes of a huge 8×8 truck, the T-33, for the Army. This truck looks modern even by 21st century standards. It carried ¼ inch armor plate and was 131” tall and 114” wide. A 450 horsepower radial aircraft engine was mounted in the rear. The T-33s were said to be the second largest trucks in the world at the time. Corbitt’s largest post-war production year was 1946 when it built 600 trucks. After that demand that had been pent up by the war began to slacken. About this time, Corbitt played a role in one of the biggest moving jobs ever. A Corbitt truck pulled Howard Hughes’ 75-ton seaplane, the “Spruce Goose”, from Hughes Aircraft at Culver City, CA to a pier at Long Beach 28 miles away. At the time, this was the largest bulk load ever pulled over the highway. The State of North Carolina was one of Corbitt’s best customers. They still had many 4×4 Corbitts when the company went out of business in 1955, and were to operate some Corbitts into the 1970s. They also owned Corbitt crane carriers. In the early 1950s, Corbitt built ten very tall cabover tractors for Turner Transfer of Greensboro, NC, a specialized machinery mover. They could seat 4 or 5 men across the cab and a man could sleep on the floor in the space beneath the windshield. These trucks were powered by 8-cylinder English Gardner diesels. They are probably still the tallest trucks ever used regularly in a highway application. They were also an early example of a tilt cab. One of the largest users of Corbitt road tractors was Riss and Company of Kansas City. Riss bought tractors completely lettered and road ready. The sent drivers to Henderson to take delivery of tractors at the factory; if they bought trailers as well, they could pick up freight on the way home. Corbitt employed about 325 people at its height. The engineering department consisted of no more than five men. Corbitt always built its own cabs and also made its own frames, using 5/16 inch chrome manganese when most competitors were using ¼ inch carbon steel. Frame rails were bought from Parish with Corbitt fabricating and drilling the frames. The assembly line moved slowly with the first truck pulling the rest up the line by chain. Every new Corbitt went through a dynamometer test and road test and was ready for work with no further preparation. Corbitt used mostly Continental gasoline engines and Cummins and Hercules diesels. It got the first 50 JBS 600 150 horsepower supercharged engines from Cummins, circa 1950, but stopped using them because of the problems they developed. Fleets tried to do the work with them they did with larger diesels, and they just didn’t hold up. In the late 40s and early 50s Corbitt even built farm tractors. They were similar to Cockshutts in design and came in three versions—gasoline, kerosene, and diesel. Most were exported to Brazil, but at least a few were sold in the US. One of these tractors is still in use, after nearly 60 years, by its original owner! Another example of Corbitt quality and longevity was “Geraldine”, a 1951 Corbitt diesel sold new by dealer R.E. Daniel to the Daniel’s Company of Springfield, MO. By the early 80s she had run up 2,600,000 miles in 48 states! In 1984 she was sold to a dump-truck operator. By 1952 R.J. Corbitt was nearly 80 years old and in declining health. The son he hoped would run the company had died. The Corbitt family owned over 90% of the company stock. Mr. Corbitt, a fine gentleman respected by all, had discussed continuation of the company with various employees, but it appeared no long-term successor could be found. So in December of that year, the company was sold to United Industrial Syndicate of New York City, a liquidation specialist. Corbitt built its last truck in 1953, though some were sold as 1954 models. Everything had been liquidated by 1955 and the company closed. After Corbitt closed, Wallace White, former Corbitt service manager, and Gus Bachman, former parts manager, continued to sell parts to Corbitt owners from one of the old factory buildings. They even assembled one complete new truck in 1958, but decided the demand wasn’t sufficient to warrant building more. The Oren Roanoke Corporation of Roanoke, VA acquired a number of the last Corbitt chassis built, along with cabs and sheet metal. Oren, a fire apparatus manufacturer, produced about 125 Corbitt look-alike fire trucks, some before Corbitt folded and some after. The last of these fire trucks was not built until 1963. When it rolled out the door, an era had ended. Forty years later, in 2003, the Corbitt Preservation Association was formed to preserve the Corbitt name, Corbitt products, and Corbitt property. We hope we have given all three a new lease on life.